Lil Baby delivers one of the best Quality Control debut albums to date. In Lil Baby’s own words, he had never even considered himself a rapper. Growing up in a single parent household with two sisters and a mother he felt compelled to provide for, the Zone 4 native had always envisioned himself a hustler. However, a victim of street violence as well as the courts since he was a teenager, he quickly adopted a crippling lean habit - perpetuated by subsequent probation sentences which prioritized the use of drugs such as marijuana over deadlier substances. Around his 20th birthday, Baby was sent to prison, unsure of what the future held for him. All the while Coach K, Pee, Migos and the rest of Quality Control had begun taking over the city. Let’s also take a second to note that in just a handful of years, Young Thug has birthed an entire generation of rappers while only consigning a few lucky souls. Lil Baby, who just turned 23 this past December, is a childhood friend of Thugger’s and began rapping under the tutelage of the ATL superstar approximately eighteen months ago - this past month, his single with Drake premiered on OVO Sound. Where yesteryear’s renegades were left to fend for themselves, the next generation, acts like QC’s Lil Baby or Thug’s own artist, Gunna, are being curated, refined and, well, A&R’d in a way that has been unheard of as of late. If you recall, Migos' own debut album barely moved 20K units the first week - Baby is set to deliver upwards of 70K. SoundCloud and streaming in general have turned the rap game into the Wild West, but the minds of veterans such as Coach K, as well as now-seasoned artists like Migos, Young Thug and Future, are now being put to honing and safeguarding the talent out of their coveted city. So while he never asked for any of this, Baby is astute and self-aware enough to seize opportunity when it presents itself. And naturally, Thug’s documented work ethic became a pillar of Baby’s own approach to his art. Despite the fact that he only started rapping last February, Baby set lofty goals for himself: he wanted to drop four mixtapes by the end of 2017. Not only did he keep his promise, he racked up multiple street hits along the way (“My Dawg”; “Freestyle”; “All of a Sudden”). His wave is both instantaneous and all encompassing at the moment. Harder Than Ever is an unrelenting project. It sections Baby’s versatility into digestible vignettes, taking extra care to tease his range while capitalizing on the wave he’s currently riding. “Intro,” the opening mission statement, sees Baby spend but one bar, the first one, telling us what strain he’s smoking (moonrock) before taking off into a breathless stream of conscious flow that sees him touch on everything from being a dropout to wanting kids. This desire to show off the technical skills he’s sharpened since his last mixtape, let alone since the start of his career, is felt on the following song, “Spazz,” and kept alive through his collaborations with rapper’s rappers Starlito and Offset. The riveting second verse on “Southside,” a dedication to the late Keith Troup and Zone 4 as a whole, begs to be considered as verse of the year. Baby’s more melodic stylings are judiciously peppered throughout. Collaborations with Thug’s other spiritual children, such as Lil Uzi Vert or Gunna, give us a glimpse into a brighter future, one where every hook could be a verse and vice versa. A world much like this one but a bit cleaner and bit friendlier, one where life goes on despite the mistakes we’ve made. Where his voice may have been slippery and elusive on his first few projects, often to his detriment, this album succeeds at highlighting his dexterity over his range. At his most somber, Baby sounds like Thug on adderall and a steady dose of Future’s 56 Nights. But at his most unbothered, like on “Bank” (which unfortunately features a poorly mixed Moneybagg Yo verse), the provocative mumble singing would make even Uzi blush. On “Fit In,” he bends his voice until “prayed for us” rhymes with “Rosa Parks.” “Cash” is a clinic on flowing: over the course of about three minutes, Baby plays with his phrasing in half a dozen ways, making a carefully crafted strip-club banger seem as if its an off-the-cuff freestyle. A lot of songs on here play like purposeful songwriting exercises, each meant to test a different facet of his continuously burgeoning talent. “Leaked” and “Right Now” see the deceptively touching rapper-turned-crooner in a revealing space that must feel as new and foreign to him as it does exciting to us. To his testament though, Baby shows absolutely no fear in baring his soul on wax. The melodies here are as addicting as anything Quavo’s written in the past two years and the rhymes approximately ten times more endearing (“I'm telling you no lies/I'm tired of seeing you cry/Come here girl, let me wipe your eye/Everything gon' be alright”). But that’s not a shot at his lablemates - everyone in QC has found their own lane. Baby’s just so happens to be one that’s rooted in gritty, heartfelt narratives, closer to a Kevin Gates or Future than Lil Yachty. When Thug - who has appeared on all but one Lil Baby project thus far - finally shows up on “Right Now,” he does so with naked honesty. Their first song together - Baby’s first official release ever - saw Thug at his most spastic; their second collab saw him at his most melodic and militant, invoking Malcolm X; on Gunna’s “Oh Okay,” when Baby threatened to upstage both YSL artists, Thug came back in for a competitive final verse; so, with “Right Now,” when Thug takes it up another notch, delivering a cautionary tale of fame and fortune, it’s becomes blatantly obvious how much Thug respects his old friend. Getting Thug on his A-game time and time again may very well be the ultimate sign of respect another rapper could receive. 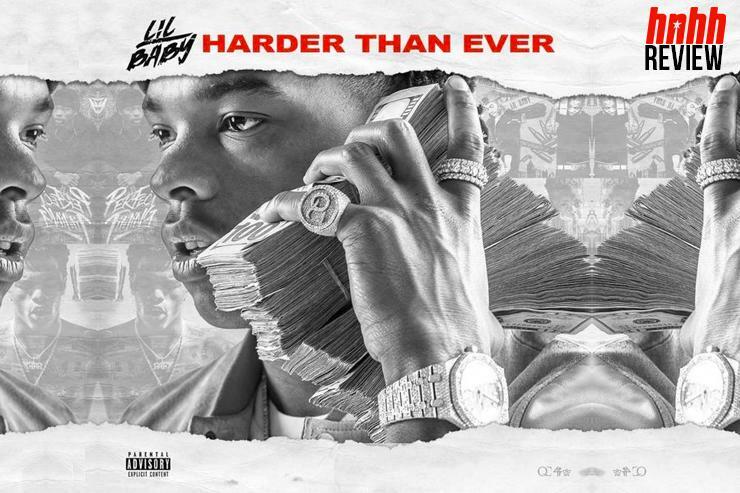 Lil Baby’s parting words hold a lot of weight in this post-Meek Mill era: “We were some teens, they labeled us grown/Had some judges that was doin' us wrong/I know your pain, just hold on/Just sing this song.” With Harder Than Ever, Baby effectively delivers the best QC debut to date and emerges as one of the most engrossing new voices in rap.